WOW! I like Jess and Jep’s story! I really had no idea what to expect… I like what I’ve heard so far – about the Robinson clan. And after reading this book, I feel like I know them much better. If you’re a fan of Duck Dynasty, you know Jep, the youngest Robertson son, and his wife Jessica. They tell their stories to give encouragement to those who have struggled. I enjoyed reading about them… as they each take turns telling their story, beginning with their childhood and teenage years, not holding back on the bad stuff, but putting it out there to share with us. Most people will be able to identify with some of the problems that Jess and Jep went through. They share their insecurity, secrets, addictions – even a divorce. Learning what they went through certainly made me feel like I knew them better; I could easily picture them at times, going through some of the same problems that many of us go through. 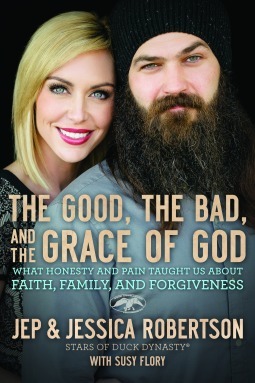 But the point is – Jess and Jep both overcame their problems – with the help of God and their families. Jep and Jessica tell about their insecurities, as well as their realization that God loves us all just as we are — even with all our secrets and sins. Duck Dynasty fans should definitely read The Good, the Bad, and the Grace of God.